Andrei Malaev-Babel is the Head of Acting at the FSU/Asolo Conservatory for Actor Training. He is on the board of the Michael Chekhov Association in NYC, and on the advisory board of Stanislavski Centre (UK). He is also a Member of the International Scientific Committee for Arti Dello Spettacolo-Performing Arts (Italy). From 1997 to 2005, Mr. Malaev-Babel served as the Producing Artistic Director for the Stanislavsky Theater Studio (STS), an award-winning company and conservatory in Washington, DC. In 2000 he was nominated for a Helen Hayes Award as an Outstanding Director for the STS production of Dostoyevsky’s The Idiot. His productions were presented at The Kennedy Center and The National Theater in Washington, DC, where he also appeared as a performer. He has also served on the faculty of The Catholic University of America in Washington, DC. Mr. Malaev-Babel’s reputation as one of the leading experts on Russian theater and acting techniques, have brought him special engagements and commissions from institutions such as The World Bank, The Smithsonian Institution, The Keenan Institute for Advanced Russian Studies of the Woodrow Wilson International Center for Scholars and the Russian Embassy in the US. He is working nationally and internationally, conducting workshops, presenting and performing for conferences, festivals and theater programs, including Russian State Institute of Performing Arts (St. Petersburg), Stanford University, The University of Windsor (Canada), International Volkov Theater Festival (Russia), the Latin American Film Festival (Brazil), The Study Centre for Documentary Research into European Theatre and Opera (Italy), The Odessa Philharmonic (Ukraine), Young Vic Theatre, and The Royal Academy of Dramatic Art (UK) and The Arena Stage Theater (Washington, DC). Professor Malaev-Babel’s film documentary Finding Babel (David Novack, dir. ), on the life and works of Russian-Jewish author and playwright Isaac Babel, has premiered at prestigious international festivals in the US, Russia, Estonia, Ukraine and Israel, and it won the Grand Jury Prize at the Moscow International Jewish Film Festival. His one-man show, Babel: How It Was Done in Odessa, has been presented by keyinternational organizations, including the UN’s presentation in Moscow. 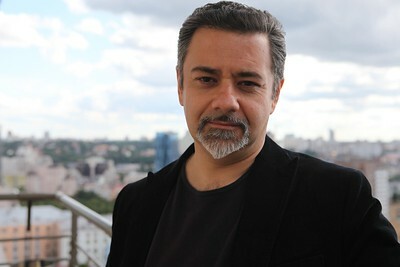 Professor Malaev-Babel is the author of the Guide to the Psychological Gesture Technique published in the 2003 Routledge edition of Michael Chekhov’s seminal book, To the Actor. Mr. Malaev-Babel’s groundbreaking volumes on Yevgeny Vakhtangov’s heritage, The Vakhtangov Sourcebook and Yevgeny Vakhtangov: A Critical Portrait, came out from Routledge in 2011 and 2012. He has co-edited and co-translated an English-Russian simultaneous release of Nikolai Demidov’s theatrical heritage, titled Becoming an Actor-Creator (Routledge, London and New York/Russian University of Theatre Arts Press (GITIS), Moscow, 2016). Andrei Malaev-Babel is a graduate of the renowned Vakhtangov Theater Institute in Moscow, Russia. He trained and worked under Alexandra Remizova, co-founder of the Vakhtangov Theater, Stanislavsky’s student and Vakhtangov’s protégé. In 1985, he co-founded the Moscow Chamber Forms Theater, one of the first private professional theater companies in Russia. Andrei Malaev-Babel (co-ed. and co-transl.). Becoming an Actor-Creator. By Nikolai Demidov. London and New York: Routledge, 2016. Andrei Malaev-Babel. “Alexandra Remizova – the “Actors’ Director”. Women, Collective Creation, and Devised Theatre. Kathryn Mederos Syssoyeva, & Scott Proudfit (eds.). New York: Palgrave Macmillan, 2016. Andrei Malaev-Babel. “Why Di Grasso? Isaac Babel and the Tradition of the Actor-Tragedians of the 19th-20th centuries.” Isaac Babel in the Historical and Literary Context. Yelena Pogorelskaya, Andrei Malaev-Babel, Dmitry Bak, Lidiya Babel, & Uri Gershovich (eds.). Moscow: Institute of the World Literature of the Russian Academy of Sciences, Russian State Literary Museum & Jewish Museum and Center of Tolerance, 2016. Andrei Malaev-Babel. “The Influence of Komissarzhevskaya and Duse on the Creative Methods of the 20th-Century Masters of the Russian Theatre – Yevgeny Vakhtangov, Michael Chekhov and Nikolai Demidov.” Vera Komissarzhevskaya meets Eleonora Duse, a special issue of Arti dello Spettacolo/Performing Arts journal, published by Universitalia Publishers, Rome, Italy, Volume 2 (2), 2016. Andrei Malaev-Babel, A. “Michael Chekhov and Yevgeny Vakhtangov: A Creative Dialogue.” Companion to Michael Chekhov. Yana Meerzon, & Marie-Christine Autant-Mathieu (eds.). London and New York: Routledge, 2015. Andrei Malaev-Babel. “Nikolai Demidov – Russian Theatre’s Best Kept Secret.” Stanislavski Studies: Practice, Legacy, and Contemporary Theater. London: Routledge, Volume 3 (1), 2015. Andrei Malaev-Babel (ed.). Ya pytaius’ vosstanovit’ cherty (I Strive to Restore the Features). By Antonina Pirozhkova. Moscow: AST Publishers, 2013. Malaev-Babel, Andrei. Yevgeny Vakhtangov: A Critical Portrait. London and New York: Routledge, 2012. Malaev-Babel, Andrei (ed. and transl.). The Vakhtangov Sourcebook. By Yevgeny Vakhtangov. London and New York: Routledge, 2011. Malaev-Babel, Andrei (ed. and transl.). “Guide to the Psychological Gesture Technique.” To the Actor. By Michael Chekhov and Mala Powers. London and New York: Routledge, 2003.